SBI looks to slash NPA by Rs 40,000 crore; can it really overcome stressed assets crisis? SBI's gross NPA surged by 98.88% to Rs 2,23,427.46 crore in Q4FY18 versus GNPA of Rs 1,12,342.99 crore of Q4FY17. When we talk about State Bank of India (SBI), we believe nothing can go wrong with this lender, even though currently the entire banking system is choking with heavy stressed assets. The rise in NPA has been going on for years and the government along with the Reserve Bank of India (RBI) has not left a single stone unturned to tackle this issue as they continue to hamper earnings and credit growth of lenders. SBI is the current king in stressed assets compared to other banks, and things turned even bleaker when the bank merged five of it’s associate banks under its umbrella, as this led to a rise in NPA. However, SBI has buckled up and with the latest news being circulated, the bank is expected to recover about Rs 40,000 crore of this money. Well this can be said as baby steps for SBI, considering the huge chunk of stressed assets it has. The Deputy Managing Director highlighted some SBI data and it’s exposure to stressed assets. Under RBI’s first list of wilful defaults which included somewhat 12 companies, SBI had a massive Rs 48,000 crore exposure, whereas in the second list it has Rs 28,000 crore - which takes the total to Rs 76,000 crore worth cases before NCLT for bankruptcy. Recently, Bhushan Steel, which was the highest defaulter in first list had undergone insolvency proceedings and was merged with Tata Steel. SBI got claim of around Rs 11,500 crore from Bhushan’s deal. Apart from this, SBI has filed around 250 cases in National Company Law Tribunals (NCLT) which has exposure of a whopping Rs 95,000 crore. So for now SBI is confident about recovering about Rs 40,000 crore, but it needs to be noted that the bank is still very far away in sorting out the NPA issue. As on March 2018, gross NPA surged by 98.88% to Rs 2,23,427.46 crore in Q4FY18 versus GNPA of Rs 1,12,342.99 crore of Q4FY17. This was also up by 12.20% from GNPA of Rs 1,99,141.34 crore in Q3FY18. In percentage terms, GNPA stood at 10.91% in Q4FY18 versus 6.90% in Q4FY17 and 10.35% in Q3FY18. After when SBI announced it’s Q4FY18 financial performance, Care Ratings agency released a study report of 26 banks including both private and public banks (also having SBI) performance for the last quarter of FY18. 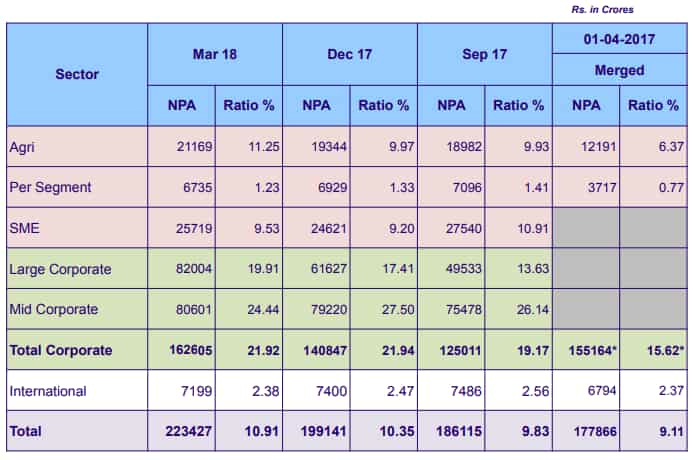 Under the Care Ratings report, 26 banks reported NPA of Rs 7,31,076 crore with a ratio of 10.14% as on March 2018, which was way higher than compared to NPA of Rs 4,81,909 crore with ratio of 10.18% as on March 2017. In one year’s time, these banks saw rise of Rs 2,49,167 crore in NPAs. Guess what! SBI accounts for nearly 31% of the total NPAs recorded by the 21 banks in value terms. This is a rise from share of about 22.75% in total NPAs of all banks in the first quarter of FY18. Gross NPAs of SBI post merger, in percentage terms stood at 9.97% in Q1FY18 compared to 9.11% in Q4FY17 and 7.40% in Q1FY17. Since then SBI has started posting losses in its financial book. As on March 2018, SBI posted a net loss of Rs 7,718.17 crore in Q4FY18 compared to net loss of Rs 3,442 crore in the corresponding period of previous year. Q4FY18 net loss widened compared loss of Rs 2,416.37 crore in the preceding quarter. SBI’s gross NPA exposure is highest in mid and large corporates with Rs 80,601 crore and Rs 82,004 crore respectively in Q4FY18. This was followed by SME at third sport having exposure of Rs 25,719 crore and agriculture sector with Rs 21,169 crore in total NPAs. Still SBI is seen as the strongest lender, which is why analysts are upbeat on this bank going ahead.